We’ll be reviewing the pre-stringing method in this tutorial. 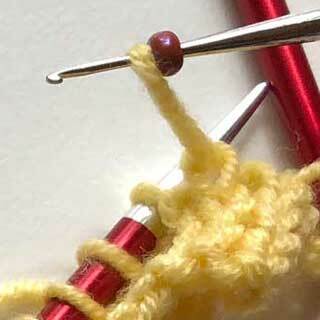 Make sure that your yarn will fit through the center of the bead. 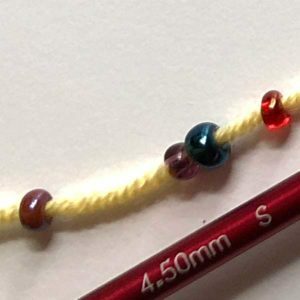 Using a thin sewing needle (one thin-enough to fit through the hole of the bead) or dental threader, thread the needle/threader with the yarn and then string as many beads as your pattern instructs. 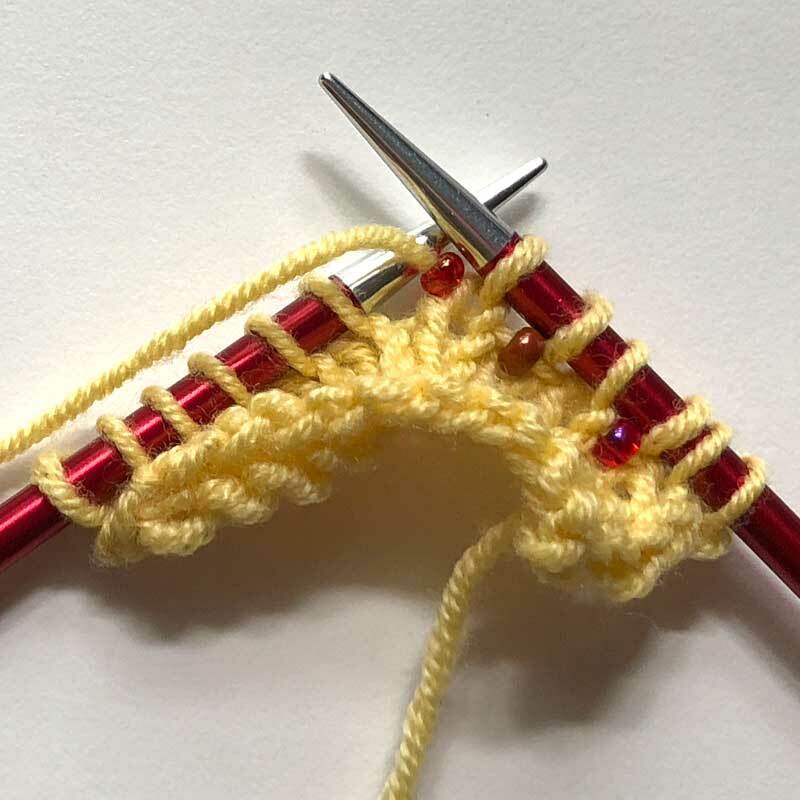 I’ve also been known to use a crochet hook in a pinch, but use a needle/threader if you have more than a few to do (truthfully, I did use a crochet hook for this tutorial because I have NO IDEA where my beading needle is – but it’ll show up when I’m feverishly looking for something else, so have no fear). 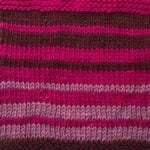 Keep in mind that the beads will be sliding down the yarn as you knit with it – and this action can be both annoying for the knitter and stressful on the yarn. 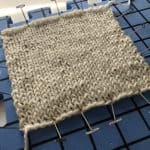 So, make sure your yarn can handle this added stress. 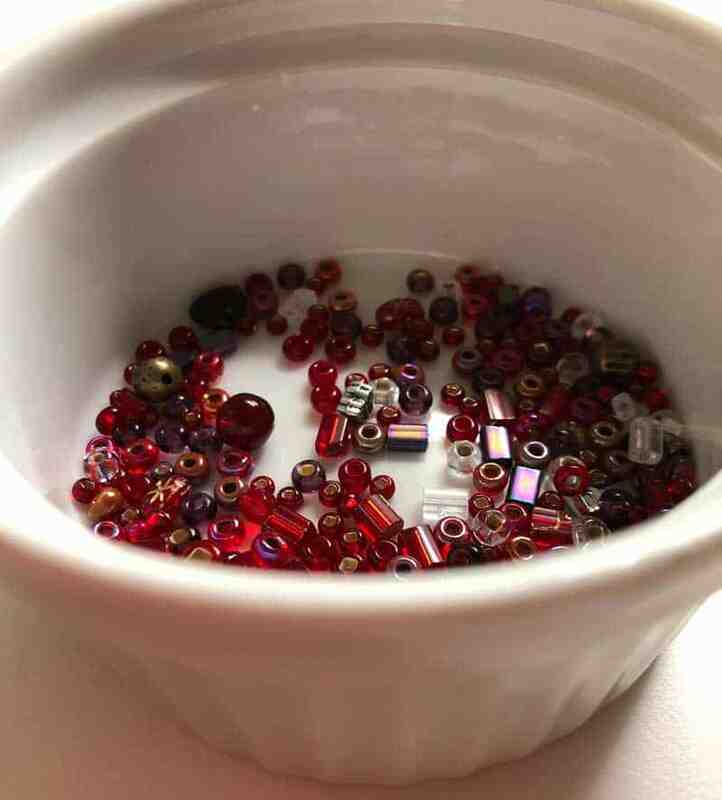 Also, make sure you string enough beads because it’s very very difficult to add more after the fact. I have successfully added more, but trust me on this and just string some extra. If you still have some remaining when you’re done, you can either cut the yarn and slide them off, slide them to the end if your end is close or even cut the beads off (if you don’t care about retaining the extras). 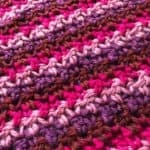 With yarn IN FRONT, slide the bead up to stitch it needs to decorate. 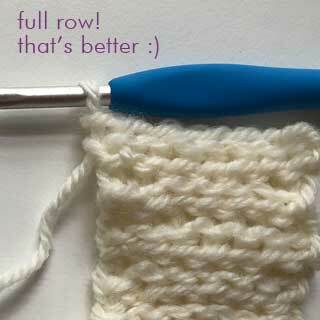 Slip that stitch purlwise while keeping the yarn in the front. Note that I hold onto the bead with the nail of my right hand. 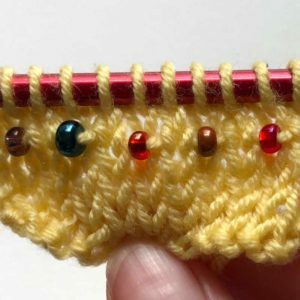 This works for me and the way I knit, but the important thing is that you don’t allow the bead to migrate down and into that stitch you’re working. 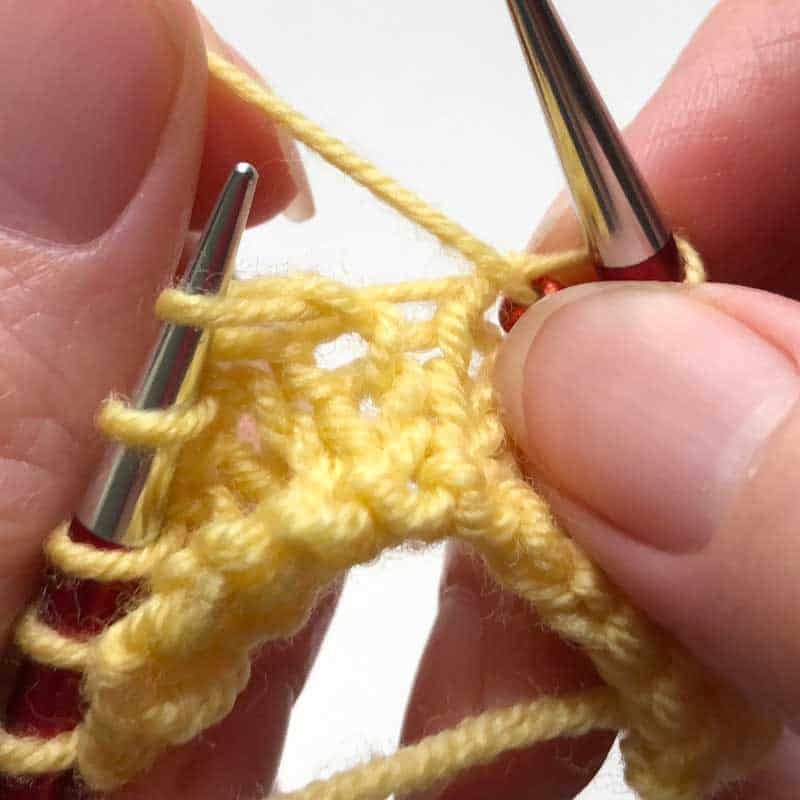 It’s this final step of working the next stitch that anchors the bead in place. 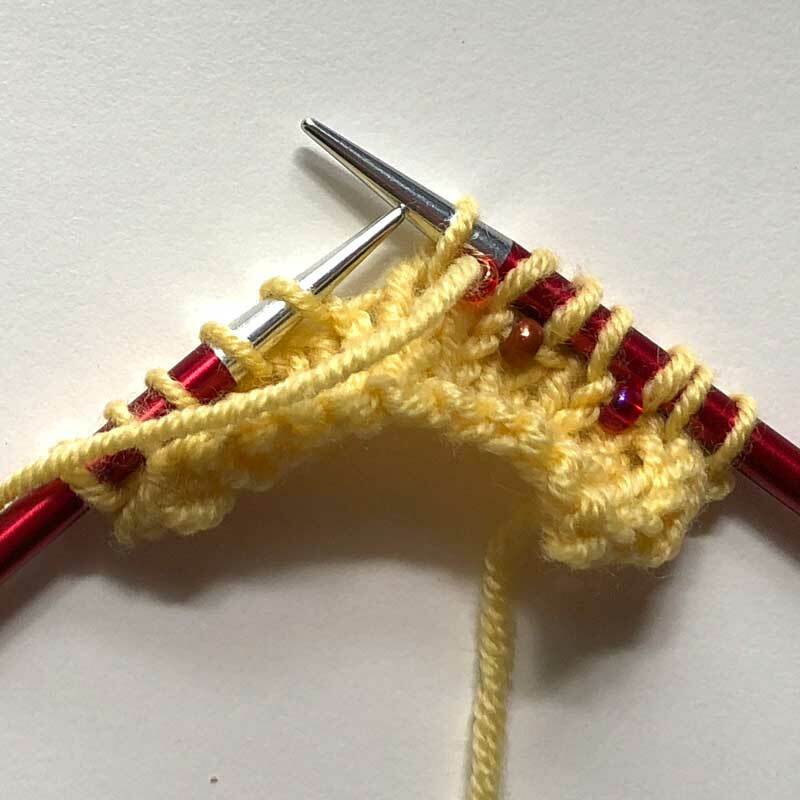 Here’s how it looks after working several stitches this way.